FILE - A combination photo shows U.S. President Donald Trump, left, in Washignton, May 17, 2018, and North Korean leader Kim Jong Un in Panmunjom, South Korea, April 27, 2018. Although the U.S. stated Thursday that summit preparations are moving forward, North Korea's threat to cancel the planned talks with the U.S. signals its frustration over Washington's position on how to denuclearize Pyongyang, said former U.S. officials who dealt with North Korea extensively. The experts said North Korea's threat could increase the chance for delaying or even canceling the summit. Christopher Hill, a chief U.S. delegate who negotiated with North Korea during the George W. Bush administration, said, "I would read the chances of a summit right now as well under the 50 percent." North Korea expressed its discontent over what it considers to be a "unilateral" nuclear demand by the U.S. through its state news agency KCNA on Wednesday, stating that it must rethink the summit, which is scheduled to take place in Singapore on June 12 between North Korean leader Kim Jong Un and U.S. President Donald Trump. "If the U.S. is trying to drive us into a corner to force our unilateral nuclear abandonment, we will no longer be interested in such dialogue and cannot but reconsider our proceeding to the [North Korean]-U.S. summit," said North Korean Vice Foreign Minister Kim Kye Gwan. Kim also expressed Pyongyang's dissatisfaction over National Security Adviser John Bolton's mention of using the so-called Libyan model on North Korea, calling it an "awfully sinister move" to compare Libya's nascent nuclear weapons program from 2003 to North Korea's program that has already produced a significant nuclear arsenal. Libya's nuclear weapons program was completely dismantled and destroyed in 2003. North Korean officials have said that after Libya gave up its nuclear program, a foreign military intervention toppled that nation's leader, Moammar Gadhafi, who was killed by rebels. The U.S. responded to Pyongyang's threat to cancel the summit by stating Thursday that preparations for the summit will move forward. "At this point if North Korea wants to meet, we'll be there," said White House Press Secretary Sarah Sanders at a regular news briefing. Following the news briefing, Trump said North Korea will get strong security protections and that the U.S. will not use a Libyan-style denuclearization process toward North Korea. Former U.S. officials warned on Thursday that the key differences on denuclearization between Washington and Pyongyang might have put the rare opportunity for the summit in peril. "I think there was a disappointment after Pompeo's visit," said Hill, referring to Secretary of State Mike Pompeo's recent trip to Pyongyang to prepare for the upcoming summit. 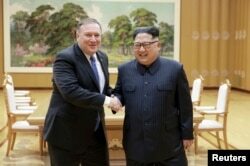 FILE - North Korean leader Kim Jong Un shakes hands with U.S. Secretary of State Mike Pompeo in this May 9, 2018, photo released by North Korea's Korean Central News Agency (KCNA) in Pyongyang. "I think they realized that after Pompeo visited Pyongyang, there was no willingness to work out sanctions step-by-step" along with a denuclearization process, Hill said, adding that North Korea is trying to say Trump is "essentially giving nothing for the summit. There is no sanctions relief, no security issues." The U.S. has said that North Korea must take concrete steps toward denuclearization before any sanctions can be relaxed. Alexander Vershbow, who served as an ambassador to South Korea during the George W. Bush administration and now is a distinguished fellow at the Atlantic Council, thinks Pyongyang's threat to cancel is "a very serious setback" that raises a question "whether the summit in Singapore can take place." Dennis Wilder, senior director for East Asian Affairs at the National Security Council during the George W. Bush administration, does not think the summit will be canceled, but said that "it is possible that the U.S. will decide it's not the time yet for the summit." Wilder said North Korea, in essence, is pushing for an incremental approach toward denuclearization. "Their position is that this has to be action-for-action, step-by-step," Wilder said. "So, I think they are trying to warn Mr. Trump that that is not a way to negotiate, that that would not be successful." Vershbow said North Korea is attempting "to define the agenda in their own terms" by disagreeing with the U.S. demand on complete denuclearization. 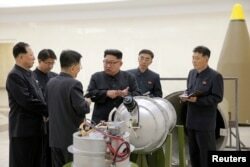 "It sounds like North Korea is trying to go back to the kind of old way of doing business in terms of incremental approach to denuclearization rather than the CVID approach that the administration is looking for," Vershbow said, referring to complete, verifiable and irreversible denuclearization (CVID) that the Trump administration has been demanding from Pyongyang. Gary Samore, a former White House coordinator for arms control and weapons of mass destruction under the Barack Obama administration, thinks Pyongyang is raising an issue on certain language in the terms of denuclearization that Washington is putting on the table. "The Trump administration is probably asking for language in the summit declaration that the North Koreans find unacceptable. For example, the deadline for completing disarmament or specific language about steps North Korea has to take to achieve disarmament," he said. 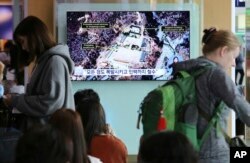 A TV screen shows a satellite image of the Punggye-ri nuclear test site in North Korea during a news program at the Seoul Railway Station in Seoul, South Korea, May 13, 2018. Wilder believes North Korea's threat to cancel the summit signifies that it gained a position of leverage over the U.S. after renewing rapprochement with Beijing. He said putting pressure on China will be significant going forward, as he speculates Pyongyang could have received an economic reward from Beijing for closing Punggye-ri nuclear test site, which is close to the Chinese border. "There are a lot of things going on between the Chinese and the North Koreans that suggests to me that the Chinese are rewarding the North Koreans for closing the nuclear test site," Wilder said. Earlier in the week, hours before Kim threatened to cancel the summit, North Korea canceled a high-level inter-Korean meeting scheduled for Wednesday over Max Thunder, joint military drills by South Korea and the U.S. North Korea called the military exercise a rehearsal for invasion through KCNA. The two-week Max Thunder drill began last week, involving about 100 warplanes and 1,500 U.S. and South Korean military personnel. On Thursday, North Korea vowed to boycott the talks with South Korea unless Seoul stops joint military exercises with the U.S.
Soyoung Ahn contributed to this story, which originated in the VOA Korean Service.